Who said a shredder can't be stylish? 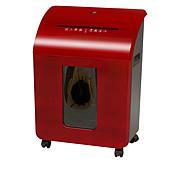 Add some flare and functionality to your office space with the Embassy Microcut 12-sheet paper shredder. 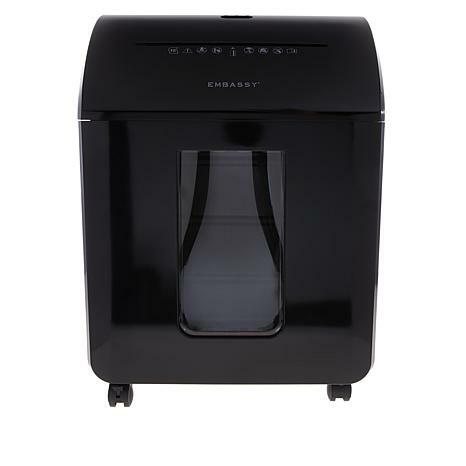 The microcut shredder allows for optimum security and smaller waste particles, which means you can shred more to fill up the 3.8 gallon waste bin. The easy to pullout waste bin also comes with a locking feature so that the the bin is spill proof when moving the shredder. Useful and pretty while it does its job! There arent too many shredders that merit a review for appearance as well as usefulness... this one gets high ratings for both! 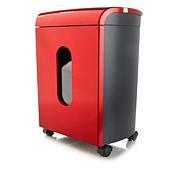 This is a great shredder. I would highly recommend it to anyone who does any type of shredding. So hesitant getting another shredder. Every one I have gotten in the past 10 years has either died an early death or just didn't perform well overall. Although I have only had this a couple weeks, I am amazed and the strength of this little workhorse. Wheels comfortably under my desk. I feel like this machine just keeps going and going. Be sure not to let the shredded paper get too high in the bin before removing it or the paper will get stuck. It shreds credit cards and staples like a dream! 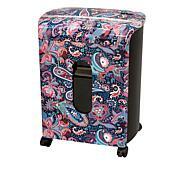 I bought this shredder for my husband since he is the official shredder in the household. Our old one finally wore out after a number of years. 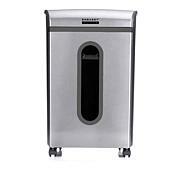 He says he is quite pleased with this new Embassy Shredder and it's performing quite efficiently. Glad we chose this one in marble. so far its working has told love it.